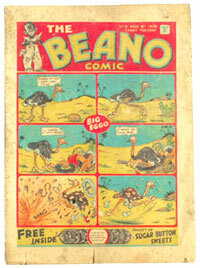 When the Beano Comic 1 reached its world record price of £7,565.00 in our auction last December with all the resultant publicity, we got a call from a gentleman who had unearthed a number 2 issue in worn, grubby condition. Although complete, he wondered if it was good enough to offer at auction in the first place. After our assurances he said that he would be thrilled to get “a couple of hundred quid” for it and popped it into the post for our March catalogue. When we received it we graded it as [fair] with an estimate of £350-400 and we illustrated the more worn back page, as well as the front, in the catalogue to give a really true picture of its condition. By the time the bidding had finished the tatty number two was knocked down for £1,028.00, the successful bidder telling us he would have gone quite a bit higher to secure it. What a brilliant result for a comic in such low grade, although one of only five copies known to exist. 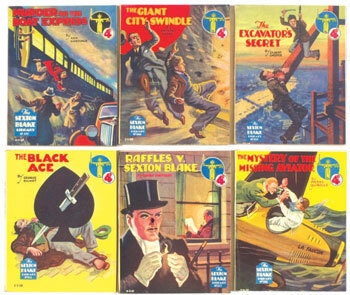 Sexton Blake was often thought of as the poor man’s Sherlock Holmes, but his adventures, told by a variety of authors, were enormously popular in the 1930s as printed by Amalgamated Press in square-bound booklet format.The richly coloured covers, illustrated by the wonderfully prolific Eric Parker, were only made of light card and they would show their wear quite quickly, the spine titling often being the first to suffer. Fresh copies are therefore hard to come by so when we offered an unbroken run of 168 issues in fine to very fine grades it created a strong level of interest. From an estimate of £550-600 the lot went to an overseas collector for £786.00. An unbroken run of the Sexton Blake Library Third Series from the 1940s, in the same high grades, will feature in our next auction which is online at the end of May. Bound volumes continue to attract strong attention, especially when the contents are in high grades, so Dandy years of 1944 and 1945 realised £887.00 and £818.00 respectively, a high average of over £33.00 per copy. We also offered the Beezer 1-363 in seven bound volumes, and these comics, published by D C Thomson between 1957 and 1962, totalled £4,192.00 or £11.50 each, very firm prices for comics from this era. Desperate Dan is not so desperate these days, his first annual from 1954 in fine plus grade sold for a cowpunchin’ £484.00, more than double the price he has ever achieved before. High grade 1940s annuals are also rare, especially when mummy’s little treasure didn’t carve his name into the page that innocently stated, “This Book Belongs To…”. A Magic-Beano Book from 1948 and a Dandy Monster Comic from 1949 were two such uncarved examples which were chased to £666.00 and £424.00 respectively. In our last Market Report we alerted bargain hunters to Mickey Mouse Movie Stories Book 2 from 1935, a rare Dean & Son publication that had failed to reach its reserve of £250.00 in our December auction. Offered at No Reserve this time, it was snapped up for £97.00, its new owner disney with delight at his purchase. When Rhythm ‘n’ Blues, Rock and Roll and Beatlemania all collided in Liverpool in 1963 independent “Beat Papers” sprang up locally to chart the progress of home-grown bands like The Beatles, The Swingin’ Blue Jeans, Gerry and Billy J. Kramer. If you weren’t lucky enough to be crammed into a sweaty cavern the night your favourite band appeared, the next best thing was to read about it the following week in Mersey Beat and Combo, two titles that only had Northern distribution at that time and were dragged off the shelves by an adulating army of fans, many eager to put their local barber out of business. 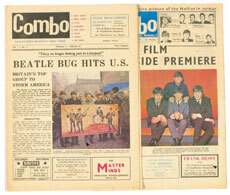 Today, these papers in early runs are rare and avidly collected, so twenty-one Mersey Beat issues with another 40 loose “pop” pages went back to Merseyside for a chart topping £510.00 and the first nine copies of Combo with No. 12 were taken to £266.00. Over the last eleven years, since we started our quarterly catalogues, we must have individually graded over 100,000 comics. The eye gets so used to searching for the tiniest flaw that sometimes it’s the obvious which eludes it. American comics, especially those from the Golden Age between 1938-1956, can go through many pairs of hands and centre pages often work their way loose sometimes separating from the comic altogether. Knowing the amount of pages that were originally published can often be helpful when grading as ad pages in these early issues followed each story and were often un-numbered. The other major flaw that can often be overlooked is “trimming”; the practice whereby unscrupulous owners attempt to give a comic the sharper look of a higher grade by shaving or trimming the edges by a few millimetres to remove or diminish small tears and chips. Silver Age Marvel comics from the early Sixties were often rough edged and chipped after the cutting process at the printers, their guillotines becoming blunted prior to resharpening. This is generally known as “Marvel Chipping”. Unsquare cuts and unparralel edges could also result during the cutting process, especially when the comics towards the base of the stack could skew round as the guillotine started its forty-five degree cut through them. One of our customers told us that there is an algebraic formula that explained this but we told him that a beautiful comic was more interesting than A Beautiful Mind. Our copy of Amazing Fantasy #15, Spider-Man’s first appearance, had its right-hand edge trimmed from nothing at its top, down to a slight taper at its base, where there was a two millimetre loss. Convinced that it was a “factory” trim, rather than a later cosmetic adjustment, the successful bidder was delighted with his purchase of this [vg+] pence copy for £734.00. Our Amazing Spider-Man #1 cents copy in [fine-] grade made a mid-estimate £1,270.00 and The Hulk [fn] and X-Men [fn+] first issues both weighed in at just under £900.00 each. Talking of trimming, a year ago I weighed a cumbersome twelve-and-a-half stone but I’m now down to a lively eleven thanks to regular swimming and jogging sessions and a balanced diet of Marvel, DC and Beano comics to sustain me. Perhaps this new trim will increase my value, but I doubt it.